The flight was an "extraordinary" use of the Open Skies Treaty. A U.S. military observation plane flew over Ukraine Thursday in direct response to Russia's "unprovoked attack" on Ukrainian Navy ships and sailors near the Kerch Strait last month, which the Defense Department described in a statement on Thursday as a "dangerous escalation in a pattern of increasingly provocative and threatening activity." 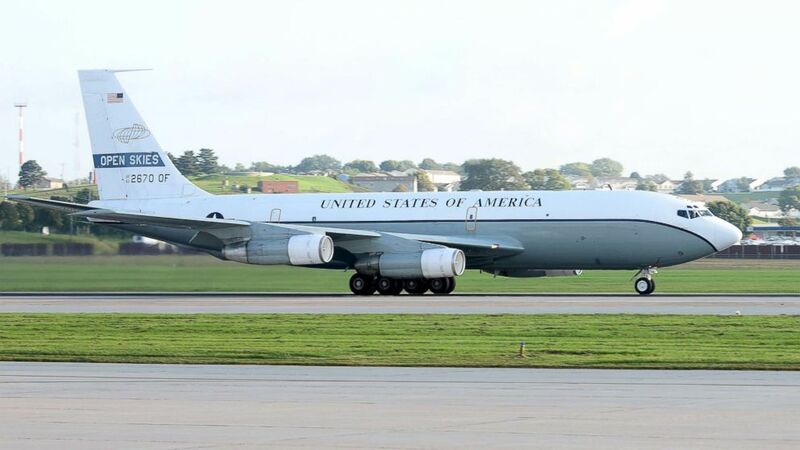 The flight of the U.S. Air Force OC-135 was the first "extraordinary" Open Skies Treaty flight since Russia's annexation of Crimea in 2014, DOD spokesperson Eric Pahon told ABC News. Thirty-four nations are party to the treaty which allows them to gather aerial imagery and conduct surveillance on the military forces and activities of other nations. The treaty "promotes openness and transparency in military activities through reciprocal, unarmed observation flights," Pahon said. But Thursday's "extraordinary" flight was conducted outside the previously agreed number of flights for the year, requested under the treaty by the Arms Control Directorate of the Ukrainian General Staff, according to Pahon. DOD would not comment on whether the OC-135's flight path crossed over Crimea. (Charles J. Haymond/U.S. Air Force) An OC-135 Open Skies aircraft takes off Sept. 14, 2018 from the flight line at Offutt Air Force Base, Neb. "The United States seeks a better relationship with Russia, but this cannot happen while its unlawful and destabilizing actions continue in Ukraine and elsewhere," the DOD statement read. Observers from the U.S., Canada, Germany, France, United Kingdom, Romania, and Ukraine were aboard the flight, which departed from Andrews Air Force Base in Maryland on Nov. 30, traveling to Ramstein Air Base in Germany before flying over Ukraine. There were 25 U.S. military personnel taking part in the flight, including a 17-person crew from the 55th Wing out of Offut Air Force Base in Nebraska and eight personnel from the Defense Threat Reduction Agency (DTRA). In August 2017, a Russian reconnaissance jet flew over several government buildings and landmarks in Washington, D.C. -- including the Pentagon, Capitol, National Mall, White House, and Central Intelligence Agency -- under the Open Skies Treaty. "They come here just like we go there," a U.S. official told ABC News at the time. "It's a mutually agreed process." Russian Open Skies flights in the U.S. are coordinated with the Federal Aviation Administration and carry U.S. Air Force personnel who serve as escorts. DTRA has pointed to valuable information gained from the Open Skies flights, including unclassified imagery gathered in March 2014 during a German-U.S. flight over Russia's border with Ukraine that helped prove Russian military activities in eastern Ukraine despite Moscow's denials. Per stipulation in the treaty, visiting aircraft are allowed to use specific wet film equipment or digital sensors to take aerial surveillance photos that are later shared with the host nation. News of the Open Skies flight comes amid heightened tensions between Washington and Moscow on a range of issues. A U.S. Navy destroyer sailed through waters claimed by Russia in the Sea of Japan on Wednesday, challenging Moscow's ownership of the area for the first time since the end of the Cold War. The guided-missile destroyer USS McCampbell traversed through part of Peter the Great Bay in what the U.S. refers to as a "freedom of navigation operation," according to the U.S. Navy's Pacific Fleet. In a statement on Thursday, Russia's defense ministry mocked the passage, claiming the ship never entered waters claimed by Russia and expressing "puzzlement at the rhetorical feat of the representatives of the U.S. Navy." Earlier this week, Secretary of State Mike Pompeo announced that the U.S. would pull out of the Intermediate-Range Nuclear Forces Treaty (INF) in 60 days should Russia fail to return to compliance. Russian President Vladimir Putin responded, saying that if the U.S. were to exit the treaty and build such missiles that Moscow would follow suit.